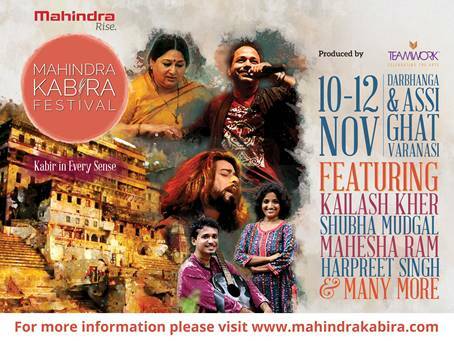 New Delhi : Taking off from a memorable inaugural edition last year, the Mahindra Kabira Festival returns to Varanasi for three days from the 10th – 12th of November 2017 with another sublime celebration of the mystical poet saint Kabir. The festival promises a specially curated experience of the life and works of Kabir, his music and poetry, and the city of Varanasi, his birthplace, unparalleled for its unique ambience, flavour, soul and history. Conceived by the Mahindra Group and leading performing arts entertainment company,Teamwork Arts, the festival will feature grassroots artistes as well as renowned names such asBindumalini & Vedanth, Mahesha Ram, Nathoo Lal Solanki, Rashmi Agarwal, Harpreet Singh, and headline performances by the unmatched Kailash Kher and Shubha Mudgal. Kabir’s poetry is all about inclusiveness – and like last year, Mahindra Kabira Festival will celebrate this philosophy and bring to music-lovers an unforgettable experience. Leading exponents of the Benares gharana and folk traditions, Sufi music, dadra, thumri, khayal gayakistyles, ghazals and pakhawaj and the tabla are all set to enthrall audiences on the historicghats of India’s holiest city, Varanasi which resonates with a mélange of voices and colours symbolic of India’s rich cultural matrix. An aural and visual feast, the second Mahindra Kabira Festival will offer an opportunity toembrace the “Kabir” way of life: soak in the music, walk the winding alleys, get chased by the ubiquitous bulls, hunt the bazaars for wooden toys, taste the delectable food on the streets and visit the weavers’ gullies where Kabir is said to have grown up. With a thoroughly invigorating and engaging programme, the Festival promises an experience that truly celebrates ‘Kabir in every sense’. Entry: Free Registration for Morning and Evening Music Performances on Saturday and Sunday. 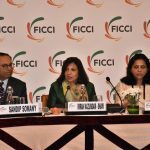 While attendance to key events is free and open to all, a customized delegate package offers a curated experience of the festival where delegates can be part of an unforgettable journey. Starting from Rs. 4000/- per room night and up to Rs. 25,000/- per room night at select hotels across the city.